In Australia, even salad is dangerous. You can do your best to avoid the death-traps of our great land. No swimming in the shark and jellyfish-laden oceans. Staying away from croc-infested creeks. Avoiding high-speed kangaroos on dirt country roads. But as one unfortunate Woolworths shopper discovered this week, a supermarket salad is still no guarantee of safety from Australia's menagerie of frightening critters. Enter the salad spider. Australia's typically known among tourists as a place rife with eight-legged freaks. Normally, we'd say that's an over-exaggeration. Just as dropbears don't sporadically spring from trees, you wouldn't typically say we have a spider problem. 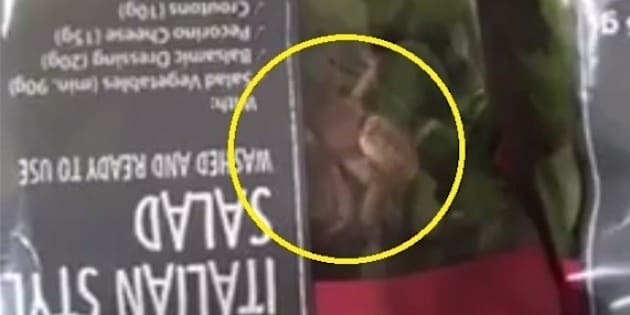 Zoe Perry picked up a packet of Italian salad mix to find a very unwelcome guest lurking within the leafy greens -- and we're not talking about the croutons. Woolies has launched an arachno-probe into the hairy incident. "Woolworths takes food safety very seriously. We require our suppliers to follow clear quality control guidelines during food processing," a spokesman told The Huffington Post Australia. "Prepackaged lettuce goes through an extensive process before being packaged. Our suppliers wash, blow dry, shake and visually inspect the lettuce. "The customer has been contacted and an investigation is currently underway. We immediately sent a food quality expert to the processing facility to see what additional measures can be put in place to minimise the chance of this happening again." Minimise. We're not saying there's much chance of you finding a spider lurking in your supermarket anytime soon. As always there's a simple moral to the story. And it's this.